Get the look and feel of leather at an affordable price plus the flexibility to choose your color. 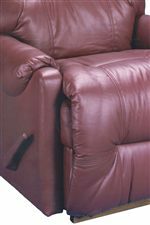 Leather match is the industry term for a piece upholstered in genuine leather on all prominent parts and finished up with a color-matched vinyl on the chair or sofa back where your body won't touch. See store for color choices available to order. A comfortable recliner can make an impact of difference when placed in a casual family entertainment room. Popular for their style as well as their relaxation features, quality recliners like this are growing into a must have necessity for new-age entertainment spaces. This fine upholstered, rocker recliner features a quality construction with plush padded cushions that extend the length of the chair, from the channeled seat back to the attached chaise footrest. 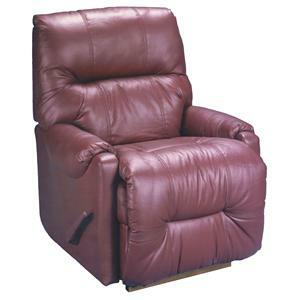 An exterior handle and fine seam tailoring, complete this rocking recliner with an added touch of detail. This reclining chair is also available as a wallhugger recliner, power motion wallhugger recliner, swivel glider recliner and swivel rocker recliner. The Dewey 9AW14 Living Room Rocker Recliner by Studio 47 at Morris Home in the Dayton, Cincinnati, Columbus, Ohio, Northern Kentucky area. Product availability may vary. Contact us for the most current availability on this product. Fabric Options Only available in leather match. Multiple Colors available. Entertainment rooms are growing more and more popular in today's media centric world and furniture that accommodates tv rooms as well as family conversation spaces creates a unique down to earth piece that enhances media participation as well as family conversation. With an assortment of options including, rocking, swiveling and gliding recliner components, this collection of chairs makes a perfect introduction into couple and family homes. The Dewey 9AW14 collection is a great option if you are looking for Casual furniture in the Dayton, Cincinnati, Columbus, Ohio, Northern Kentucky area. Browse other items in the Dewey 9AW14 collection from Morris Home in the Dayton, Cincinnati, Columbus, Ohio, Northern Kentucky area.